This has been a very good summer for the Stavanger area, with great weather for most of the time, and a lot of visitors enjoying themselves and being surprised by just how nice it is here. The last cruise ship of the year visited Stavanger today, and sailed out at 21.30 this evening. The "Lili Marleen" was one of our smaller visitors, but was here regularly through the summer. We have seen many other cruise ships, including Queen Elizabeth 2, Aurora, Lirica, Oceana, Oriana, Sea Princess, Maasdam and Artemis, along with many others. Last year the Queen Mary 2 dominated the harbour during her visit. 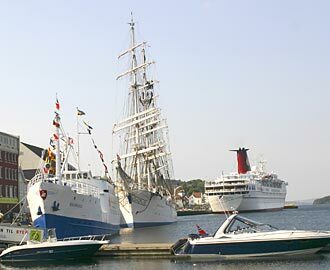 Also in Stavanger today is the tall ship race veteran "Christian Radich". This sailing ship is used for training purposes. We were treated to the sight of many of the trainees climbing the masts and proving that they don't suffer from vertigo. The cruise passengers may have left us, but we still have many visitors, and lots of events plus other activities and trips out to entertain them. The weather is warm, and we're expecting some more sunshine yet.